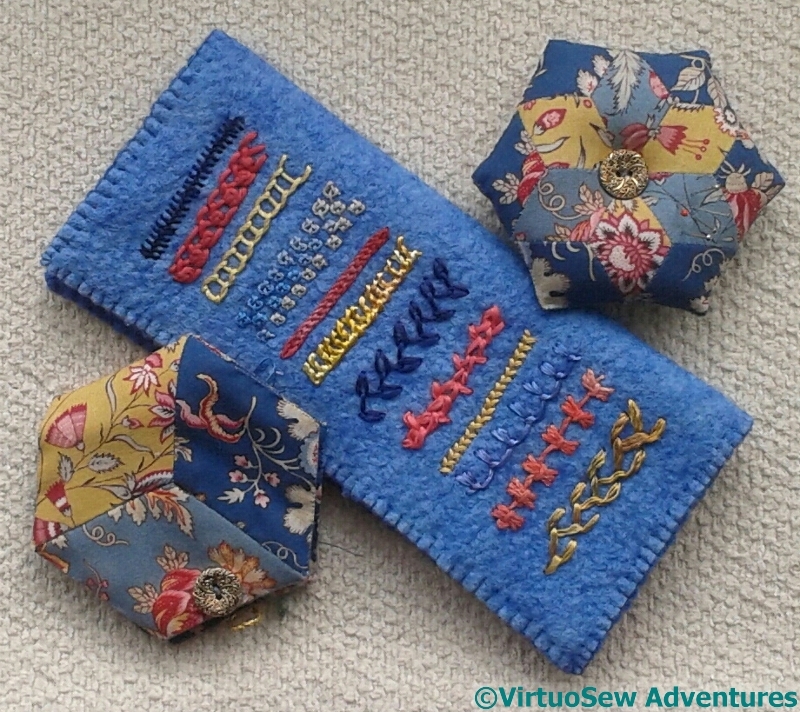 Here is something else I completed while I was recovering from Loading The Felucca, pictured with the two gifts from Alison that inspired my colour choices, a pincushion and a needlecase in English Paper Piecing. Considering that I selected my colours from stash, I think they have a surprisingly similar “feel”. Some of you will recall that a couple of years ago I made a case to hold a wooden stiletto and mellor as a gift for my cousin. I’ve finally got around to making a case for three bone stilettos and a wooden mellor for myself! I’ve included several stitches I haven’t done before, or use only rarely and I’ll write about those later. 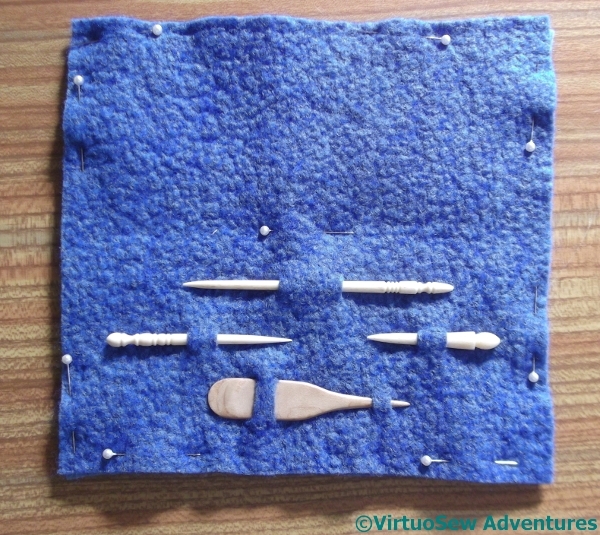 It was a little tricky to find a suitable layout for the tools, but I finally decided I liked this one. I’ve blanket stitched the edges together, now, and I intend to needlefelt the layers together, just as I did with the other one. When I find my needlefelting tool, which has gone Absent Without Leave! That is lovely, gorgeous stitching and the colours do go really well. I can’t do many embroidery stitches myself, something I would love to learn in the future. Good work, and a good match. the surface of the felt is divine…. That would be a neat case I’m sure. I know where all my needle felting stuff is -I just haven’t used it for quite a while! I do remember the case you made for your cousin. Nice that you’ve finally got around to making one for yourself! 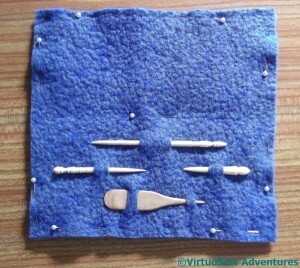 Hope you find your needlefelting tool soon! I love these and the colors are perfect together. What a pretty little tool case! And a great way to showcase stitches that you haven’t done before or use rarely and I imagine it was a great memory refresher in the process. Maybe even providing ideas for places you could use them in the future. And thanks so much for linking up your adorable embroidered teddies blanket to last week’s Stitchery Link Party! The teddies are so cute, especially the ones with the ice cream cones to tie in with the family business logo. Love the gifts – your colour choice for the case you’re making is perfect. I look forward to seeing more of the stitching you did… I have a hankering to do some counted thread embroidery myself – I always loved samplers and think it’s high time I made one for myself. I remember that case – well done on finally getting round to making your own. Has the tool turned up yet?